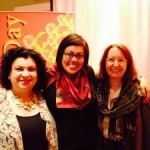 Home » Business Blog » Ten Reasons to Attend Global Love Day! San Francisco Bay Area women–come join me and the fabulous C.J. Hayden, and other heart-centered women who are working to make a difference in the world, at the Lodge at Sonoma Resort and Spa, on March 14th (Global Love Day). If you haven’t experienced A Good Deed Tea event, you must come see how some Bay Area women are making a difference in the lives of women and girls in some of the world’s most impoverished areas. You’ll be inspired, while connecting with some amazing women. Ladies love love LOVE to spend time with other ladies. This is something that I say all the time. And, as entrepreneurs, you may not get to spend much time “with the ladies” if you’re working all the time. Power of Love Foundation, Zambia, supports women caring for AIDS orphans with business training, microloans, and health education. Sakhi for Girls Education, India, provides literacy training, books, and self-esteem skills to young girls in the slums of Mumbai. Did you know that you need a minimum of eight hugs a day? Hugs are a powerful way to heal, and there will be hugging! See this article about hugging. There is no better time to see Sonoma. The drive up is beautiful, and you’ll see vineyards, estates, and the gorgeous spring flowers. It’s a vacation right in your own backyard! You probably haven’t forgotten how to talk, but meeting new peeps gives you the opportunity to learn about others and have them learn about you. Some of them will make you smile, some will make you laugh, and some will certainly surprise you. If you’re already part of the community, you will have the chance to reconnect with everyone, and deepen the connections you already have. Global Love Day is about inspiration, so we’ll all get to elevate our love for other girls and women, here and throughout the world. Between our featured speakers, we will be making reusable sanitary protection kits that will be distributed to developing world girls through Days for Girls International. Don’t you want to be around other women who are like yourself? Women who are optimistic, who want to change the world, and make it a better place? Of course you do! Because You Really, Really Want To! My friends, I promise a fun and fulfilling day of friendship, lovely ladies, and delicious food, too! To sign up, click on the link below. You can buy raffle tickets here, too! I want to attend Global Love Day. $50 admission includes speakers, lunch, networking, and service project. Register me! I want to attend Global Love Day, including everything above, and purchase 30 raffle tickets for a total of $75. Register me!